My wife is an events organiser, and in her early conferences, juggling a load of must-do items and decisions was a key pain point as she kept many critical plates spinning. The stress of keeping all of it in her head at the same time filled up the cognitive capacity she had available to actually work on any of them. We’ve all worked had people working for us whose answer to When will that thing be done? is I’m working on it … and it never seems to appear. Who are super busy all the time, yet never actually deliver. The most helpful people in taking on work; the least helpful in completing it. Continually asking for things, being promised them and not getting the results is one of the most frustrating situations a leader experiences. These problems have a single root cause: trying to do more than the natural capacity. We all know that when things get tough, the improvement that might make it better is the first to die. To stand any chance of getting out of this pain and start being able to reliably make and fulfil commitments, there is one simple remedy. Do less. It’s counterintuitive as our gut tells us that the sooner we start something, the sooner it will be done. But the opposite is true: when we deprioritise starting new things in favour of finishing existing ones, our queue of work clears and we output the value we crave. The only way to do this is to focus on the Wildy Important. The one Wildly Important Thing. Just one. Identify the one thing that would make the most difference. Do that, and only that. Finish it and clear it out of your cognitive load. Move on to the next. Repeat. 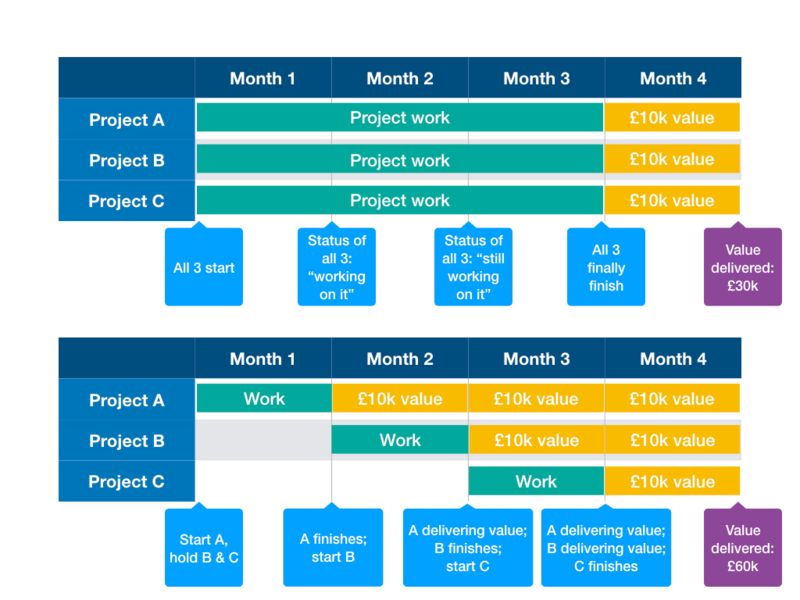 Imagine 3 projects, A, B and C. Each takes your team a month’s worth of work to complete and delivers £10k of value per month once done. When the team are working on all 3 in perfect parallel, it will take you 3 times as long to deliver anything, and their valuable outcomes have less time to make an impact. Many job adverts for all levels of roles seek effective multitasking. It’s a great idea. If we could do it, it would be wonderful. But that’s not how humans work in knowledge-intensive tasks. We invariably task-switch involving the effort of setting a mental save state, and the effort of resuming when we pick up the task again; the now, where was I with that? factor. The more cognitively intensive the work, the harder this is. Work such as deep analysis or creativity takes as much as 30 minutes to get out of and back into the highly effective state zone. When you split your three projects across the entire team, it won’t take 3 months to get any of them delivered, it will take 5 months. Teams were killing themselves to launch on time. We were doing too many things & it was taking too long to make decisions because management was juggling too many projects at once. Simply managing multiple projects escalates the draw on your management capacity. How many status reports are you collating? The industry of spreadsheets. The meetings to track them. The follow-up meetings to ask why everything takes so long. That’s just the formal load. Add running into a stakeholder in the coffee queue and being asked “how’s my thing doing? then being lobbied to add more. The more items you have committed to, the more of this work takes place. Many software companies have an industry in managing defects. Refining backlogs, creating queues of work that stretch years into the future, while everyone knows that most of them will just never get done. We know this is the wrong approach. We know to under promise and over deliver, yet time and time again, we’re unable to make that a reality. Why do we get into this situation? It’s very simple – when someone short on patience, and long on political clout asks you to do something, the easiest thing in the world to answer is “Yes”. The only possible way out is to start saying “No” more. Understand your capacity as a zero sum game: for every new thing added to it, something has to come out. Be ruthless. To focus on the Wildly Important to the exclusion of everything else. Here’s how my wife coped: every item went on a post-it on a flip chart, divided into 3 areas: To do, doing and done. The secret was that the ‘doing’ section had space for exactly 2 post-its, allowing for one item being blocked. Until one of those moved to ‘done’ the post-its in “To Do” received zero attention. When each thing was completed, it was cleared from her workspace, both mentally and in the desk and wall space she spread to. This acted as a forcing function, when both items were blocked. When you’re in that situation, you just have to get on and unblock one. When something was completed, there was another forcing function, forcing a decision about what that next Wildly Important Thing was. And the most critical forcing function of all was to say “No” to her client a lot. That client was me. And I ended up a lot happier because of it. If this sounds familiar, I have one immediate action and three ongoing behaviours. Take all the things you’ve currently committed your team to do. Kill half of them. Things will get better. Always know your Wildly Important Thing. Discuss it with your sponsors, your peers and your team. Make sure there’s consensus on this. If anyone asks you to take on anything new, the default answer is No unless it comes with a proposal for something already committed that you should drop. Take on a mantra for yourself, your sponsors and your team: Stop Starting, Start Finishing. Repeat this in every meeting, and whenever a new thing is proposed. Keep repeating it until you hear other people telling it to each other and see them acting on it. This piece previously published on CA’s Agile Management Blog. Focus: A Leadership Superpower by Martin Burns is licensed under a Creative Commons Attribution-NonCommercial-ShareAlike 4.0 International License.